ABCMarketsControldemo is a demo version of the ABCMarketsControl utility that manages already opened trades on any symbol by moving them to a breakeven when the price reaches a certain level. Besides, if the price goes further in favorable direction, the utility moves Stop Loss and Take Profit accordingly. You can check the utility operation in the strategy tester on any symbol on a period from January 1 to December 21, 2017 by setting the time_start_buy_demo and/or time_start_sell_demo parameters defining a test trade open time. NOTE! For correct ABCMarketsControldemo.ex4 operation, time_start_buy_demo and time_start_sell_demo inputs should always be within the January 1 - December 31, 2017 time interval. Loss_free_level - profit, at which a trade is moved to breakeven (in points). Default is 40. Step_modify - modification step (in points). Default is 40. 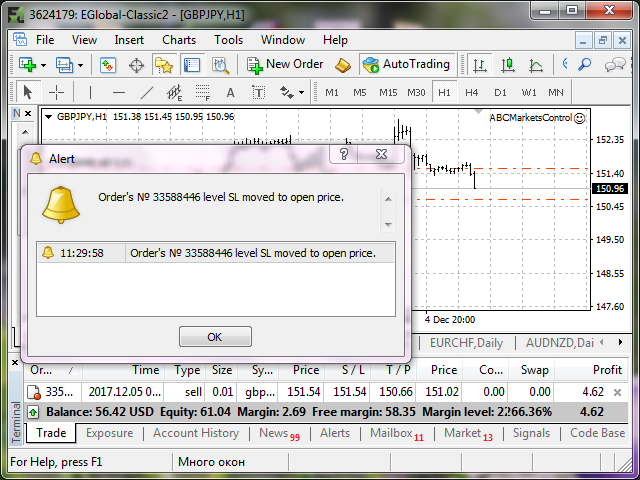 Max_level - maximum profit starting from Open price a trade hypothetically strives to reach (in points). This is not a Take Profit! Generally, this is the next strong price level (reversal or consolidation) defined on the financial instrument's daily chart. Default is 300.
m - multiplier. Training accounts = 10, real ones = 1.
time_start_buy_demo - test buy trade time using the yyyy.mm.dd hh:mm:ss date format. 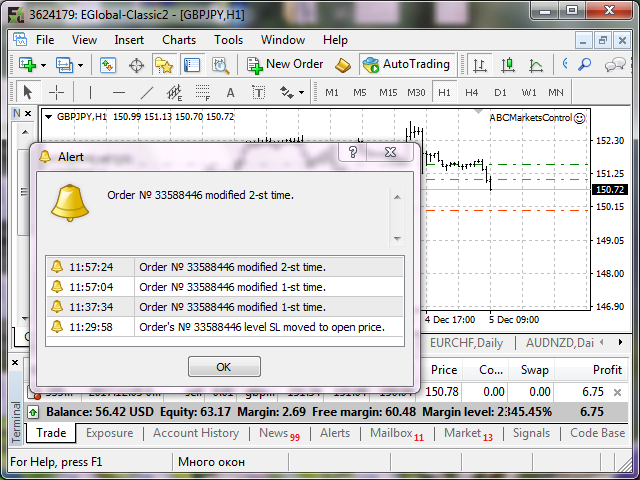 time_start_sell_demo - test sell trade time using the yyyy.mm.dd hh:mm:ss date format.